One extremely popular kind of slot machine with the largest jackpots would be progressives. These refer to various machines running on one network that use a sum of each bet and insert it into a jackpot that keeps building until someone wins. 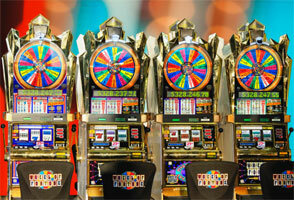 Multiple pay line slot machines consist of more than just one pay line. Three pay line machines are very common, with one pay line sitting in the center and between the other two. If a winning symbol combination is spun that directly lands on a line, you may win. However, it is only possible to activate every line by inserting the highest coin amount into the slot machine. If only a few coins are inserted and you get a winning combination at the top, you might not win a single thing. However, if you put three coins in, regardless of which line hits, you are going to be a winner. So, the advantage in playing with these machines is the fact that higher chances exist for winning. However, you need to remember that this is merely the case whenever you bet the highest coin amount. Multiplier slot machines are extremely common in casinos, too. On such machines, changes in payout will depend on how many coins you play. For instance, if you get a combination with a payout of $20, but you only inserted a single coin, you are going to get $20. However, if you put 2 coins in before spinning, you will get $40 and 3 coins will give you $60. Bonus multipliers are similar to the multipliers. However, whenever the highest coin amount is inserted when you get a winning combination, you will also get an additional bonus. For instance, putting one coin in will win you $100, while two coins will win you $200, and three coins (the highest) will win you $500. Now that you know the different kinds of slot machines out there, you can play. Just make sure you read every machine's schedule of payouts first and find out what kind of game sits before you.